Love that mirror. Beautiful photo. I love bathroom pics. That and my bedroom are my 2 favorite rooms in a home! And I would definitely choose deconstructed over slick modern stuff, beautiful! Loving the blooms on the side. Gorgeous addition. I love this picture - I would take it anyday and never complain about having no counter space! And, I would take your friend's lake house in a heartbeat - what talent she had. I would also take old and worn anyday. That mirror is divine! I agree, that's why European interiors resonate so much more with me. They get to start out with time worn spaces!! I toally get that, and I love looking into the mirror and seeing what is behind. Yes, a thousand times yes on that! Have you ever heard of milk paint? Google it. I bought some to re-do a dresser I bought. You will love it! I am sooo with you on this! Yeah. I'll roll that way with you! Divine! And I spy a beautiful cabinet in the back. Lucky owners! Love the blooms and gorgeous old mirror! totes the same. although when you combine time worn beauty WITH utility, then i am truly happy. Beautiful picture ... the best! Amen for that! I am so with you on this sis. 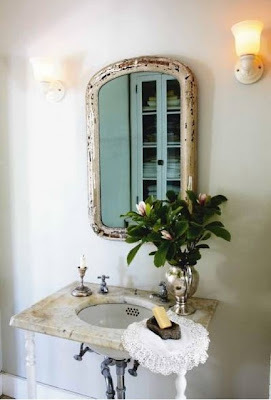 PERFECT quote: Give me time-worn beauty over utility any day of the week... YOU ARE BRILLIANT MY FRIEND!